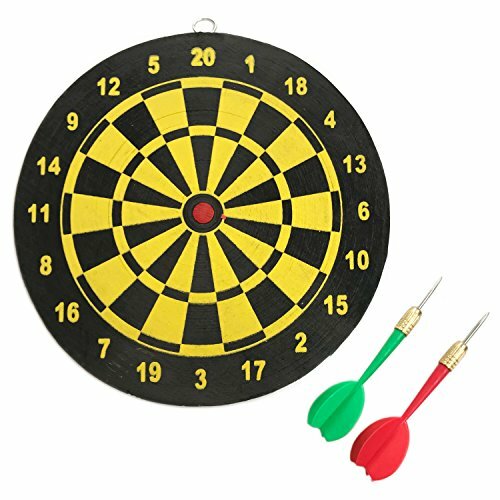 Perfect for bedrooms, dorm rooms, offices, travel, or any other compact space, this small 8" double-sided dartboard is all you'll need to have a great time wherever you are! Dartboard features traditional numbered dartboard on one side, and bull's eye target on the other. This set includes two sharp 4.5" darts (not intended for children) and a dartboard hook for convenient hanging. Small 8" dartboard set with 2 darts! Perfect for bedrooms, dorm rooms, or any compact space! Double-sided dartboard to keep games interesting! If you have any questions about this product by Thacher's Nook, contact us by completing and submitting the form below. If you are looking for a specif part number, please include it with your message.